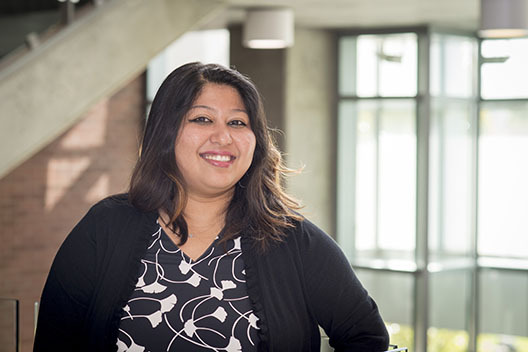 Arman had never been to America, never heard of Washington State University, nor had she ever imagined that her education in biotechnology would fit into a pharmaceutical sciences program. By coincidence, a WSU professor in Spokane knew one of her professors at the institute in India where she got her master’s degree. Arman’s professor suggested she contact that person – Shobhan Gaddameedhi, assistant professor in pharmaceutical sciences. She sent him an email, and after some back and forth, the interview was scheduled. It was almost three agonizing weeks before Arman heard back from WSU, but at 5 a.m. on Feb. 17, 2016, she learned from an email she was accepted. “I thought I would jump up and down, but I just felt relieved, and sat down and let it sink in,” Arman said. She is the first in her family to study outside of India. Getting a visa was a bit of a hassle. She could not use the word biotechnology to describe her field because it was too close to bioterrorism and that would mean an excruciating background check or automatic rejection. There were other quirks too, but finally a visa was approved. Finding housing in Spokane was next, and she searched Craigslist for a while and was completely confused about the monetary exchange rate. Eventually, she discovered WSU Spokane has a contract with Places 4 Students and so in another coincidence she found a room to rent in a house on the South Hill about five minutes after the landlady had posted it. The landlady checked her out on Facebook before she agreed to rent to her. Arman first landed in America on July 26 at Sea-Tac Airport and then took the short flight to Spokane, where she was met at the airport by her landlady, the only person she knew in Spokane. When she arrived, she had a master’s degree in biotechnology and a good understanding of molecular biology and how cells work. From her bachelor’s degree dissertation in science, she had learned two important things about herself: she did not want to analyze research data on a computer, but she did want to be a wet lab researcher. She also had had that discussion with her parents that is common in her country about marriage. Arman has not experienced culture shock in America because she had seen the “Friends” and “Seinfeld” TV programs plus many American movies. However, the stereotype that all fair-skinned people are rich was hardwired into her brain. It was a shock to her when she got lost while walking one day and asked a nearby white person for directions and he replied he would give them to her if she paid him. She realized then he was homeless. Now age 27 and entering her third year of the pharmaceutical sciences Ph.D. program, she refers to herself as a toxicologist. She never thought she wanted to be one. Now she feels passionate about being one and about her research project thanks to her mentor and advisor Assistant Professor John Clarke, Ph.D. In Clarke’s lab, her research project is to study a particular toxin produced by the blue-green algae common in lakes all around the world and how it affects nonalcoholic fatty liver disease, which is the result of a diet high in fat and cholesterol that is common in the U.S. and gaining prominence all over the world. “I’m looking at whether this toxin affects the healthy liver differently than the liver with the specific disease condition,” she said. When she can write a dissertation about her project and defend it in front of a panel of professors she will be finished with the program, which can take four to five years. Her parents and brother visited her last summer for 40 days and together they went for a road trip across the western United States. Arman had gotten her driver’s license the month before and managed to get them through Los Angeles. Yes, it was crazy, but it was also strange to drive from L.A. to Las Vegas through so much land where there were no people. “There are people everywhere in India,” she laughed. She still lives with the same landlady on the South Hill and there is another student there too who is from Kenya. The three women share the kitchen. “It’s almost like a second home,” Arman said. Spokane also is like her homestate of Assam, India, where she spent the first 16 years of her life, except for the snow, that is. There is no snow in Assam. She likes it, but not the ice and black ice and the short winter days. She writes about life in general and includes positive quotes from the fiction she loves reading.